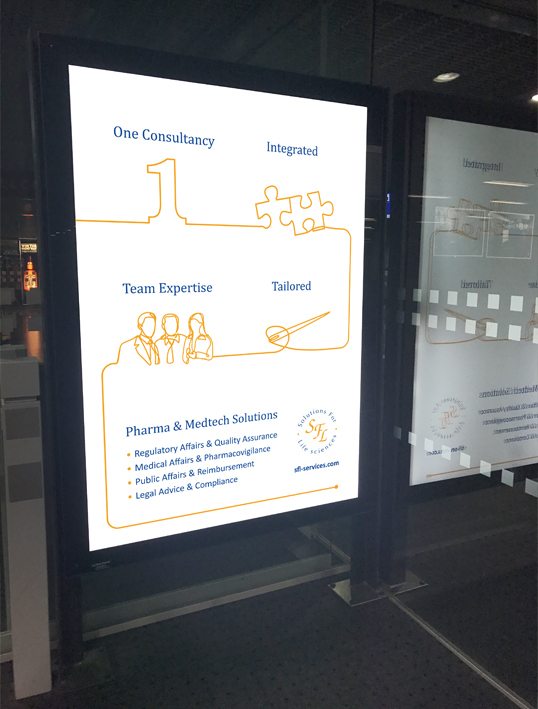 Recently, an opportunity came up for Design Inc to support one of our Swiss-based clients, SFL, with some out of home advertising (OOH) to be positioned at Basel Airport. And, of course, we jumped at the opportunity. SFL are a specialist regulatory consultancy for the pharma & medtech sector, providing Regulatory Affairs, Public Affairs, Medical Affairs, Pharmacovigilance, Legal Affairs. 1. Where was the advertisement to be placed? Airside in a narrow, darky lit corridor. 2. Where within the traveler’s journey would they see it (eg near the restaurants / on the way to the plane / as they come off the plane / after baggage reclaim, etc)? 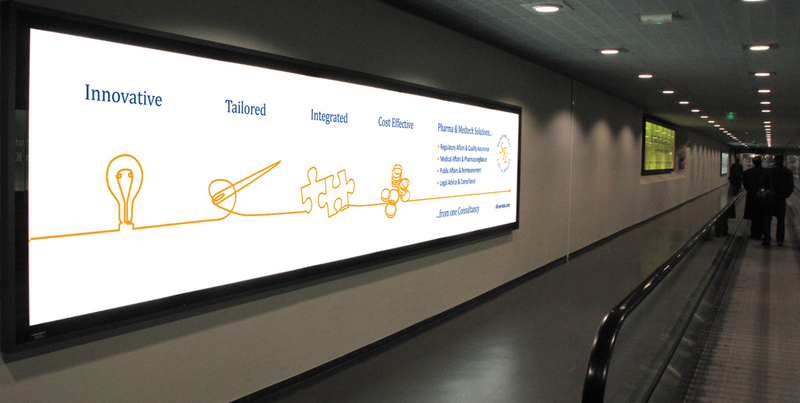 The advert was to appear on the left hand side wall of a corridor leading passengers from landing, through to passport control. There was a travelator and walkway along the corridor. 3. What size was it to be? The advert was to be 6 metres long x 1.3 metres high. 4. For how long would the advertising appear? The advertisement would remain in place for one whole year. 5. Were there other out of home advertising in the same location? Yes, this was one of a series of long adverts along the corridor wall. 6. Who was the target traveler/audience to which the client wanted to advertise? Pharma or medtech professionals coming into Basel. 7. Would this audience previously have heard of the company? Not all but certainly some would. 8. What was the message the advertising needed to make? To promote the organisation’s multidisciplinary services within the pharma & medtech sector. 9. Why was the company wanting to promote this message now? They were looking to expand. 10. What was the goal of the advertising? To raise awareness and for the audience to make contact. 11. What was the underlying proposition? That the company has all the skills & solutions that a pharma/medical device company may need. And that all these services were in-house, which is a rare thing. – The advert was long and the corridor thin so the traveler would not get to see the advert until they were walking past it. – The advert was on the left hand side so the design needed to take into account a start and end point, with the start point being the left hand side of the artwork. – For those using the travelator, the message needed to be simple so that the viewer ‘got it’ quickly as they sped past. – As the poster would be placed in a frame with backlighting in a darkened corridor, we needed to design something that would shine out. The fact the artwork needed to be so long was a main concern for Design Inc. It was a large advert so could incorporate so much, but it was positioned in a place that limited the amount of content the viewer would take in within a short space of time. As such, we created the advert to work as a left to right process and utilised the concept of a single, unbroken line to suggest simplicity in the process. 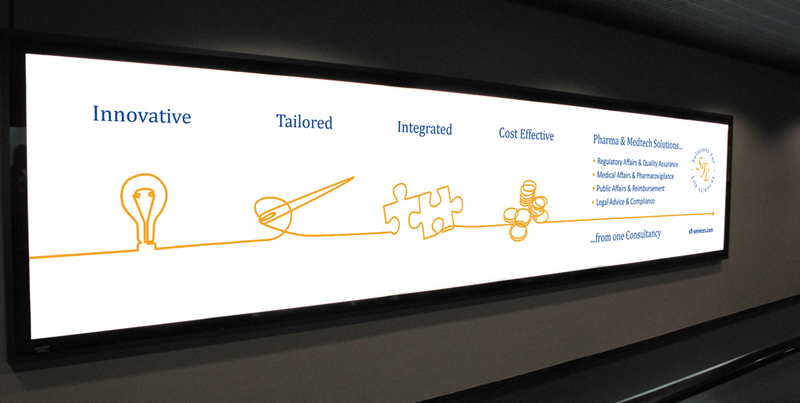 This unbroken line was used to depict four main values of their corporate solutions – Innovative, Tailored, Integrated, Cost Effective – and to lead the viewer’s eyes to the solution, which was the company itself. The advertisement was designed to be most effective on a white background in order to benefit from the backlit panel. Whilst Design Inc were solely responsible for the creative part of this project, ClearChannel managed the advertising space sales and production at Basel. Plans are already afoot for another campaign at Zurich and we wish our client good fortune over the coming years. Design Inc is a full service creative agency based in Staines-upon-Thames, Surrey with a specialism in out of home advertising campaigns. We provide design & creative services for any out of home advertising you may have planned and, if you are looking for your advertising campaign to be memorable, unique and affective, let us work with you to ensure it is a success from day one. Talk to our Client Services Director, Frank Norman on 01784 410380 or email him now. To view the Design Inc advertising portfolio, including examples of out of home advertising, click here.